My big kids love brownies ... especially dense and rich chocolaty brownies. These brownies tasted slightly moist and slightly spongy perhaps I did not use white chocolate. Added only the dark chocolate for the chocolate batter. A quick and easy bake for our morning brekkie. These warm brownies were gone within minutes before I could capture a decent picture of it with a cup of coffee. 1) Preheat oven to 180°C and position the rack in the center of the oven. 2) Line an 8 inch (20 cm) square pan with parchment paper, grease with some butter. 3) Melt the dark chocolate in a large stainless steel bowl placed over a saucepan of simmering water. Remove and set aside. 4) Melt the butter in a small saucepan over low flame. Set aside to cool. 5) Combine the dry ingredients B in a big bowl. 6) Using the same saucepan for melting the butter, combine and whisk the wet ingredients A. 7) Pour the wet mixture into the dry ingredients and fold using a spatula until combined. 8) Pour about half of the batter into a bowl. Mix in the melted chocolate with a manual whisk. 9) Place the batters into the prepared pan by alternating spoonfuls of vanilla batter with the chocolate batter. Then, with a toothpick, gently draw swirls through the batter to create marble effect. 10) Bake for 20-25 minutes, or until just set in the middle. Test with a toothpick inserted in the center comes out clean, do not over bake. 11) Remove the brownie from pan and transfer to wire rack to cool completely before cutting into squares. Do not over bake else the brownie will be dry. The temperature of the oven may vary, do adjust accordingly. Karen, my big kids love brownies too. The swirl is nicely done! 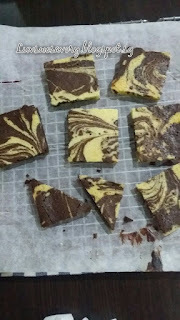 Karen, very unique looking brownies. Usually they are just brown but yours is so attractive with teh marbling! Hi Karen. I love brownies too. 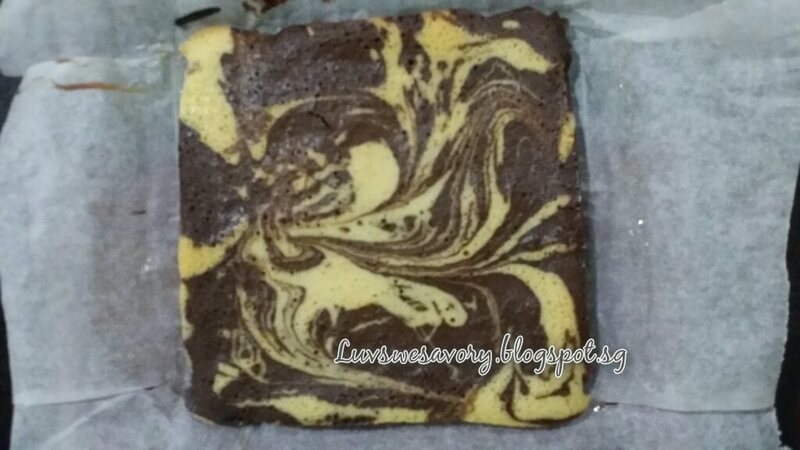 Love the marble effect if this brownies. Fresh out of the oven is always best. I can imagine how yummy these must be! Brownies gone too quickly before you can take more photo of them... I know. I know. I had to smack hands and also fast hand fast leg taking photo whenever I bake any brownies. LOL! Perfect swirl Karen, we love brownies!